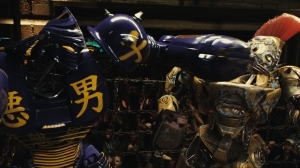 Full movie trailer for robot boxing flick REAL STEEL! The full trailer for Shawn Levy‘s robot boxing movie Real Steel starring Hugh Jackman has landed. It's your classic underdog sports movie with one twist. Robots in the ring, baby. Apparently the studio is so happy with Real Steel that a sequel is alreay in the works. Check out the Real Steel movie trailer after the break. haha. I think that looks good you know. The robot's name is Adam? A tribute to Adam Link?